The PLO’s spokesman, Saeb Erekat, released a statement today in response to Al Jazeera’s publication of The Palestine Papers. The release is pasted below. The statement would seem, at least at this early stage, to reflect genuine panic on Erekat’s part. The standard denial of something having been “taken out of context,” which is often very valid, plays very badly when the full contents of the minutes of meetings and entire documents are what he is addressing. His statement that the PA position has maintained the traditional Palestinian stances — “…to establish a sovereign and independent Palestinian State along the 1967 borders with East Jerusalem as its capital and to reach a just solution to the refugee issue based on their international legal rights, including those set out in UNGA 194…”– is clearly contradicted by the contents of the Papers. Even more, the assertion that the PA made today, that Al Jazeera was essentially acting as a tool of the Qatar government, which is relatively friendly toward Hamas, has no foundation. It’s similar to the Israeli tactic regarding the Goldstone Report, which was to try to attack the source’s credibility rather than deal with the substance, which was largely unassailable. Also today, a mob of Abbas supporters attacked the Al Jazeera headquarters in Ramallah on the West Bank. They did some damage an no one, apparently, was injured. The crowd was said to number around 250 people. Was that staged? Who can say, though I have my suspicions. 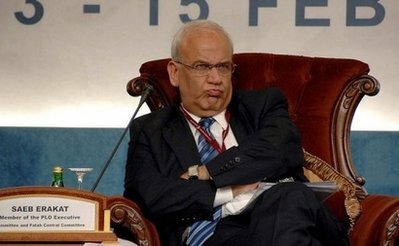 But if a lot of Palestinians really bought Erekat’s response, that number would surely have been much higher; Ramallah is a pretty packed city.